In his book, The Skinny: On Losing Weight Without Being Hungry: The ultimate guide to weight loss success, Dr. Louis Aronne explains that the key to weight loss is to manage a combination of factors including brain chemicals, sleep and medications. According to Dr. Louis Aronne, one of America’s top weight loss specialists, the secret to losing weight and keeping it off has nothing to do with willpower but instead is related to addressing imbalances in our biochemistry. Aronne says that if you are having trouble losing weight it is not your fault. He states that dieting involves changes in the body’s metabolism and weight-regulating hormones, like insulin and leptin, which can result in an excessive appetite even when you are consuming enough calories. Aronne’s program is not a traditional diet but rather a method of controlling your patterns of eating that helps you to reduce your cravings and avoid the feeling of hunger that occurs on diets. The focus is on eating a low fat, reduced calorie diet based on wholesome nourishing foods that are low on the glycemic index and high in fiber. Dieters are advised to start each meal with salads and vegetables, followed by lean proteins because this will help you to feel full. Other foods that can increase the feeling of fullness and satisfaction include soups and spicy food. The carbohydrate component of the meal is eaten last because this is when you will have more control over your appetite. Alcohol should always be consumed with the main meal or after dinner. This strategy helps you to reduce your intake of foods high in carbohydrates and fat, such as pasta and dessert, which can cause rebound cravings and hunger when overeaten. For the same reason, The Skinny Diet instructs dieters to always eat a protein breakfast, while avoiding fruit juice and limiting the intake of starchy foods such as cereal toast and oatmeal. Aronne says that dieters who eat protein for breakfast are more successful at losing weight because it helps control appetite and cravings throughout the day. In addition it is recommended that you weigh yourself regularly and ensure you obtain adequate sleep because studies show that these factors will increase your chances of successful weight management. Fruits, vegetables, eggs, chicken, fish, nuts, seeds, legumes, whole grains. Exercise is strongly encouraged as a way to boost metabolism, feel better, lose weight and keep it off. The Skinny Diet includes a simple but effective exercise routine that involves forty minutes of aerobic activity such as moderately intense walking and a twenty-minute strength-training program. Aronne says that adding more walking into your daily lifestyle is the best way to overcome plateaus and for maintaining weight loss. The Skinny: On Losing Weight Without Being Hungry: The ultimate guide to weight loss success retails at $24.95. Created by a doctor who specializes in weight loss and nutrition. Focuses on long-term strategies for weight management. Encourages the intake of a wide variety of healthy foods. High intake of protein and vegetables can reduce appetite while dieting. Acknowledges the importance of adequate sleep. Some readers may find the contents of the book too technical. Weight loss may take some time to become apparent. Does not contain any particularly new insights. Although there is not much new information in The Skinny Diet is an effective and simple plan that will help dieters to lose weight and stay healthy. The focus in on increasing the intake of high-nutrient foods that helps to control the appetite and balance blood sugar levels, which will help dieters to reduce their intake of calories without experiencing hunger that is common with standard methods of dieting. Aronne, L. J., & Bowman, A. (2009). 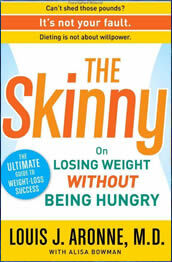 The Skinny: On Losing Weight Without Being Hungry-The Ultimate Guide to Weight Loss Success. Harmony.